It's fun being a school mom. Today we had a field trip to the local cross country ski trails. What a day! The sun was shining. The air was crisp. The company was fantastic. It's not often that I get to spend time with my first born. So many other things and kids demand my time. The ski club provided lessons for all levels. Michael was thrilled to be in the intermediate class. I was really impressed with his attitude. He didn't enjoy going up the hills, but he didn't complain as I kind of expected him to do. He did a fantastic wipe out at the bottom of a hill and got up laughing! When did my little boy grow up? How was I blessed with an awesome kid? Now, he is eager to sign up for ski lessons and he's got his little brother on board! It's a good thing Dad's got all those extra hours of over-time! Kidding, mostly! Today was a day of memories, Michael's and mine. This will be one of those day he looks back on and remembers when he has his own little kids that he is dragging around a field! I thought a lot about my Mom today. 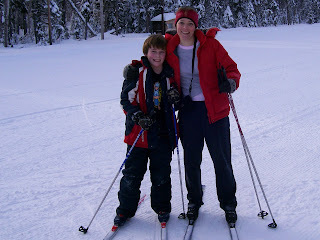 I have my own memories of skiing with her and I often wonder why she put up with my whining and bawling. If her reason was to instill a love for winter sports in me so I would spend today with my son, it was worth it. Thanks Mom! I hope she reads it!